I realize that this tutorial is not craft-related. However, I hope this will be helpful information to some of you. One of you kind readers brought it to my attention, giving me a link to facebook where the image had been shared and liked over a thousand times. When I saw it my heart sunk and I felt sick. You see, I have been pretty open about using my children in photos and I love sharing my life with all of you. So, I thought it would be helpful to explain the process of removing the picture in case any of you have something similar occur. Not only that, but I thought I'd explain some extra security measures you can take to help you out as well. 1) Find the source. I probably should have calmed down a little before I sent a message to the person who shared my photo on facebook. It is always most beneficial to be kind, even when you're upset. I kind of went off on him, assuming that he had created the picture. He hadn't. After changing my tone a bit I asked him if he could direct me to where he found the picture. He did. You see, you can search for an image by the address, but that doesn't always work - especially if the image has been tampered with and resaved. Anyone can take a screen shot of any picture on the internet and then pass it off as theirs. Scary. 2) Find the web site owner's contact info. I now knew the original site that the facebook guy found it from, but I wasn't sure how to get in touch with anyone. I did some research and found out you can find the contact info for anyone with a web site. You just google "whois _______" and add the address of the site. It will pull up a lot of options and most of them will give you an email address and often times a full street address. IMPORTANT SIDENOTE: That was another thing I hadn't realized and it kind of freaked me out. When I googled myself that way it was extremely easy to find my actual address. If you are still using a blogspot address, you're probably okay, but if you have your own domain it's registered to you under what address you provided. I use Network Solutions to register my site and I found out you can pay about $9 more to have their security added. That means they'll list their address instead of yours. I don't have a P.O. Box or alternate address to use, so this was a great option for me. Now you won't find my personal info when you use the whois directory. 3) Contact that person and ask them kindly to remove the image. Explain that it was stolen. The owner might have an employee that created the image. Explain that if it isn't removed that you will file a complaint with google. Hopefully that will work. You must remember that even if they remove the image immediately, it might take a while until the image stops appearing in a google search. 4) If the person doesn't remove the image you can file your complaint with google HERE. That link wasn't easy to find. It took a lot of searching on my part. After I did all of this I asked the guy from Facebook kindly to remove the image as well, explaining how it made me feel. He was very nice and removed it immediately. I felt really relieved knowing it was all over. However, I also thought about the security issues involved. I know that everyone talks about watermarking your pictures, but in my view that's a just a warm fuzzy and a whole lot of false security. No one puts watermarks across the focal point of the photo or there's no point in having a photo. You put them a little more out of the way, where they can easily be cropped off. And as I mentioned, with a screen shot and a small crop your images can become anyone's. So my recommendation? First off, I think it's important not to sweat the small stuff. Most photo sharing actually promotes your site and helps you. Most people aren't trying to ruin you. However, if it involves your child and something it portrayed in a negative way then I believe action is needed. And, secondly I highly recommend googling your own site with the "whois _______" and seeing what info is available to anyone. I picked a few blogs I read and did a search this way. I was floored by how many home addresses I found. Some of you more protective people might be shocked that I've continued to blog and use pictures of my kids. It's something I've actually thought a lot about. I choose to share my life. I believe that sharing can do a whole lot of good. I know that I am uplifted by reading blogs of people who I feel like I know. I think the sharing brings us together and helps us feel connected. I don't feel like all of that needs to be given up because someone is not considerate. However, I believe that knowing how to fight any problems like this is essential. And now we both know how. Thanks for stopping by. I'll probably be back later today with boy or girl news :) Stay tuned. Thanks so much for sharing this. I actually stopped blogging (not that my site was anywhere NEAR as popular as yours) because of these exact things. Even though I'm not blogging, I'm still going to check the whois thing to see what pops up. And have fun today with the ultrasound! That is so exciting! Thanks so much for the whois info. i never even thought about that. i just did mine and my hubby's name comes up. we don't have the same last name :) i didn't register to see what other info they have, i think i will have to look into that with him later. can't wait to hear the news!!! Thanks for sharing this, Cheri! I think I would have gone ballistic seeing something like that on the web. I'm glad you were able to get it taken care of! And this information will be invaluable. Pinning, sharing, and checking myself out with "whois" now! I love reading blogs, especially yours. I guess it makes me feel connected and gives me ideas of things to do with my son. My husband is SUPER private and doesn't want anyone to know anything about him (for whatever reason... just who he is) so I could never blog. Thanks for going through all this to share a bit of your life with others. I'm excited to find out the gender of your baby! This must have been awful. I have tried hard to keep my kids names and photos off of my blog for fear of someone using them in a horrible way. Its hard because you want ti show off your cute kids but then run the risk of someone abusing this. Glad you were able to get it sorted. Thank you so much for sharing this, I can imagine how scary and frustrating the whole ordeal would have been! It is something I am ever wary of and it scares me. Especially since I can't work out how to unlink my private google plus account from my blog! I am sooooo glad you shared this with us! WTH!!!! I would have roared too momma! Glad it is all taken care of. Thanks so much for sharing your experience with this! I had no idea! Years ago I found that someone stole an image from my website. It wasn't a photo, just an icon I made to link to another area of my website. I couldn't understand how this person found it-it was really nothing special, just pink type on a black background with the font specific for my website. I found out that it came up via a google search because of the file name I saved my image with. Interesting! So now I try not to be too descriptive in my file names with images I upload. Thank you for continuing to share your life and crafty tutorials with us, despite what has happened! I'm so glad this didn't scare you off of blogging about your lovely boys. There are so many things out there to scare us and make us worry and it's very difficult to step back and evaluate the trade-offs in a reasonable fashion (especially when we're talking about kids). So it's great that you did that, you dealt with the problem, and you even found an extra step you can take without giving up how you want to run your blog. Another thing you can do to find out where your images have been used is to do a Google Image Search. You can drag images from your computer or from the web right into the search box of Google Images and it will find all the matches for that image or similar images. It's really great for tracking down copyright issues for photos you've posted online. Thanks for the tip on this. I've always wondered about that. A situation like this has been a fear lurking in the back of my mind. Thank you so much for sharing this. Wow! I am so sorry that this happened to you. Thank ou for sharing the information you found about protecting yourself. I think you are very courageous to continue to blog. Thank you; I love your blog and love reading about your beautiful family. Funny you should post about this because over this last week I've had to submit a couple of those forms through Google to have my images remove. Years ago when I started blogging I had someone take a picture of my youngest (then 1yo) and totally bash how she looked on some mom forum. I stumbled on it by accident and boy it was not cool at all. Thankfully it was removed- but these days it's people stealing my photos and making a big collage with them and then adding my text and posting them on their site with no links back to me. Plus they are making $ off their ads. So frustrating. Thankfully Google has yanked my stuff off their sites, so it is an effective tool to fill that form out. Thank you for the info on the whois search. I'll have to look at that. If everyone could just be honest it would make things so much easier! ;) Thanks for the great post. As a mom with three little boys, I would've been freaking out also. This reminds me about a cooking blog I read regularly that had her WHOLE blog stolen, not just the pictures. It took months for her to get it back. I didn't even know that was possible. The internet can be a little scary at times. I'm glad you decided to keep sharing your life. Let's face it, someone could quite easily take a shot of your child on his way to school without your knowledge and do whatever with it and you could not influence it all. Short of hiding in a cupboard we have to live life and live in the world of today which is not always nice. I'll go whois.... now to check myself out!! wow. I'm so glad you told us this! Definitely gonna check the address thing. I let it all hang out, too, but yeah I would be upset about my child's picture with inappropriate commentary, too. Something to think about for sure. I originally felt the same way as you about sharing my life. Only recently, I decided that I needed to think about reigning in what I share. I have made a personal decision for my blog and we definitely have to do what we think is right for our family. This post confirmed my thoughts. Thanks for sharing. Thank you so much for sharing your tips/lesson and thank you also for continuing to blog despite the mishap. I'm so sorry that this happened to you. So exciting thought to find out what your having!! Thank you thank you thank you for sharing this information! Especially about the "whois" search. I had no idea!! Such great information to share - I'm trying to spread the word! Thanks for the tips! And YES be back and let us know boy or girl, I am so excited for you guys "I" can't wait! That is awful! Do you have any idea how I would go about taking those safety measures if I got my domain from Go Daddy? I have been blogging a long time, too, and am always worried about something like this happening, too. I have had my host serve as my address for years, too. I try not to make it too noticeable where I reside and blur out school names on my kids' pictures when I need to do that. As long as you are on the lookout and know things like that happen, then that is all you can do. That's awful, Cheri! I am constantly worrying about something like this happening to our family, so I find that I've been posting less and less personal photos of the kids and more closer up photos of their hands doing their craft work. I'm so glad that you got it resolved! Great post, I'm about to go check my sites. My husband is pretty adamant about me not putting pictures of my children online...I have in a couple of small instances but usually I photograph them from behind or obscure them somehow (but a small percentage of my posts are kid-related so that's not hard for me.) I had no idea about my address though-thank you!! This happened to me TWICE with pictures of me and my kids. And they went so viral that there were too many sites. I got exhausted after tackling some of them and never made it through the still growing list of sites. It breaks my heart. I agree you should try. But I think at some point once it is out there.... it is out there. What a wonderful service you are providing people by sharing this. Thank you! It is a classic example of how people can take a good thing and abuse it. Ugh... this makes me sick to my stomach. Going to look into PO boxes tomorrow morning. You're the bomb for pointing these thhings out. Thank you for sharing this! Sorry that this had to happen to you. However, I really admire you for continuing to blog and share photos of your family. It makes your blog so much more genuine, and I think it's awesome that you continue to do it even though you had a scary experience. So many comments...You live up to your blog name! :) I am glad you continue to blog. Can't let just one bad experience over run your love of blogging, not to mention you have enough people following that they are also looking out for you. Keep it up! Such a fun to read your posts! And congratulations on the baby girl! So sorry you had to go through this. Thank you for sharing this information it is scary what people can find out. Thanks for sharing this info. Even though it's a shame you have to experience this, at least you can help others navigate the unpleasant experience if they find themselves in similar situation. Funny sidenote: I tried to the whois search you mentioned and the results located me in Romania and Phoenix, AZ, both of which are entirely inaccurate (try Canada). But it's nice to know people don't have my information! Gack... what a nightmare. I just registered my domain and switched to WP and had no idea that my info was out there, so thanks for that information too. it sounds pretty easy but I have a very excruciating time with dealing with Google about this. One person who does not like me (and I don't even know who he/she is) created a Blogspot profile of me with my name and family name and stealing my photo for that profile . The description was ridiculously embarrassing because the profile was written in the first person "describing my own self" as an uneducated, illiterate, ugly whore who degrades other people. I don't know who the site owner is apparently. Since it's a Blogspot profile owned by Google, I thought it was best to address this issue with Google. But Google is uncooperative insisting to me that I should get a court order for them to remove it. I could not get a court order since I don't know who the site owner is. I wrote them a letter again that I could not do that and instead I submitted copies of my passport, ID, and birth certificate. I told them "these documents prove that it is really me asking the site to be terminated because that profile is fake. I even told them that how could I write nasty things about myself in the cyberspace calling myself a "whote, uneducated, illiterate and degrading people." But to Google, they're not enough coz they don't care until you have a court order. This was in 2009, and still it's 2013, the site is still up there. It's really sad for me. But I'm just praying to the Lord that whoever who created that profile shall be given his /her own karma. Therefore , it's not really that easy. Oh better beware also if you register your domain because they will put all your personal information out in the web. If you must buy a domain name, request for a HideMyInfo for additional fees. Thank you for this. Just this morning I found a photo I took of my daughter and a friend being used without permission or credit in a local advertisement and on their face book page. The person who did it is a graphic designer and should know better! I was irate. But I appreciate knowing you've been through this and your advice on how to handle it. Especially the reminder to be kind. :) I kept my cool and asked them to remove my photo and they did. Great info! I really appreciate it! So sorry that happened I would have been furious too! Great post and I must say that I have an online web store in which a company in China was using my photos to promote their business. I did send several emails to the company in which I asked them to remove my photos and I even put in a blurp about international copyright laws. They finally removed all my photos but it took some work. I then started investigating how I can protect my photos online and I came up with a company called Digimarc which put an electronic watermark on your photos so you can easily trace where your photos are being used on the internet. I just started using this so I hope this will work and save me from having to go through this again with another company. I'm really sorry this happened to you. It just happened to me this weekend as well. Someone stole 50+ photos from my blog and created a Facebook profile with them, claiming them as her own. Also, my daughter's photo was posted on a fan page underneath a bunch of pictures of murdered children. I FREAKED. That photo has been removed, but despite being reported to Facebook a number of times the profile with my photos remains. Great post! And thanks for the tip- going to go google my address now. And yes- I figure I can be paranoid and freak out about everything or just keep blogging and doing something I love. Thanks for that. I checked the photos of my son and found one had been stolen. They even put their watermark over mind. I filed a DMCA complaint with their host. Unlike you, I am not so brave. I am removed all photos of my son from my site. I am so sorry about what happened to your family. I'm glad you got it solved. When I share or use another's photo it's always done positively, and I always give credit or not e the image source. 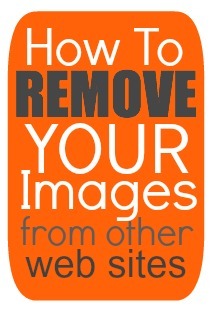 One can hire a reputation management company which specializes in removing unwanted images from search engines. The results are quick and the work is done in a professional way. Thank you so much for this post! I just searched around and found a photo of my baby had been uploaded to a free wallpaper site and was available for downloading, all without my permission! Totally not okay! Another tip I would add is that you can google an individual image. https://www.google.com/imghp?hl=en&tab=ii If you want to be sure that image of yours has not been used or shared with other sites you can search it by either entering the image url or uploading the image to the google image search option. Go to google images and then click on the little camera in the search bar!! It's a good tool for parents - make sure no one is posting pics of your children where or how they shouldn't be! It's not all over. What people don't realise is once a picture or post has been put up onto the web, it is there forever. There is a site called wayback, which can retrieve website pages from as much as 10 years ago. Also, if just one person saved the pic from the screen and put it elsewhere, it will still be floating around out there and you'll never know. All that having been said I am glad you posted this information. As a person with next to no imagination I "borrow", "copy", "paste" a heapa buncha stuff from Internet searches onto my blogs. Consequently I am working to make sure I pay it forward via referencing sources. Additionally I have a disclosure and image disclosure on my blog with email for an owner to contact me directly if I failed to give credit or they simply want their image removed. Now that I have found Pinterest, oy vey. I wonder about all the "pinning" and copying I am doing. Someone posted photos of me and my fiancee on a terrible gossip site called the dirty dot com. They refuse to remove it. What can I do? Hello! I got to this post through a share on Twitter, and I'm happy to see that everything's worked out! As for the whois information, you only see a ton of information about yourself if you own a domain. Your domain registrar is required to enter in the name and address of the person who's purchased the domain. However, some registrars will allow you to purchase a "whoisguard" - they'll put in jumbled information instead, which is what I've bought for my own domain name through Namecheap. Hope that helps!